Marketing can be defined easily. As you know, it is about creating value for customers and building lasting customer relationships in order to capture value from customers in return. 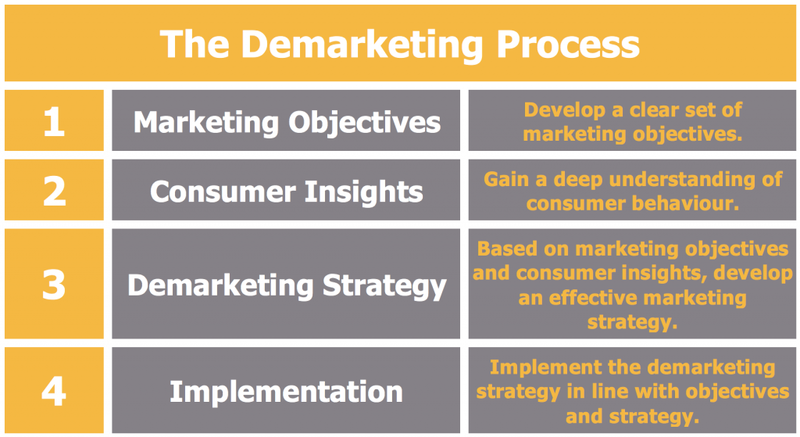 But what is demarketing? Is there an opposite side of marketing? And what would the purpose of demarketing be? Yes, demarketing exists and there are specific purposes why it does exist. In short, demarketing is marketing aimed at discouraging customer demand. While the objective of marketing is to stimulate customer demand, discouraging aims at exactly the opposite: a demand reduction. Although it may be very uncommon in mainstream marketing, demarketing can be observed quite frequently. It involves the application of marketing principles and practices to curtail customer purchase and use of particular products and services. These products and services are normally ones that are typically considered undesirable from a societal perspective. In other cases, products or services are demarketed out of scarcity in supply or a perceived need for rationing (such as in the case of water). There is one more issue driving demarketing: the spill-over effects of product consumption, as for instance the pollution caused by automobiles. Demarketing involves the development of a set of clear marketing objectives, the process of gaining a deep understanding of consumer behaviour, the development of an effective marketing strategy and finally the implementation in line with objectives and strategy.